Solar powered roof vent fans are a very economical way of cooling a home. Solar energy is free therefore using a solar powered fan will reduce monthly electric bills right from the start. There are other benefits to using this type of fan to cool a home including lessening humidity. This is because there is an increase in ventilation by using a fan. And because there is less humidity or dampness it will mean less mildew or mold in a home. Mentioned above were a couple of benefits that come with using solar powered roof vent fans, but more can be said. There are certainly other benefits that come with the use of a solar powered fan. The first, as mentioned previously, is the energy savings. The savings alone often entice homeowners to install a fan of this type. Another cost benefit in addition to the energy savings is that they can prolong the life of a home's roof. This is because when using a solar powered fan it helps keep the attic from extreme temperature both in summer and in the winter. 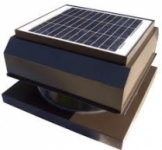 Manufacturers of solar powered roof vent fans include Solar Dynamics, LLC. This company was one of the first companies to produce this type of fan and on their website claim to have the "most powerful 20 watt" fan around. Another company that specializes in solar powered fans is Ventamatic. A popular fan they sell is a solar powered ventilating fan with panel and roof mounted ventilator. Innovative Skylights is yet another solar powered fan manufacturer. There models are called Sun Rise and range from 11 watts to 20 watts. All three of mentioned companies can be found via the Internet.